(CNN) -- Faced with a projected $42 billion deficit, California Gov. Arnold Schwarzenegger warned Tuesday that 20,000 state workers will lose their jobs if a budget deal isn't reached by the end of the week. 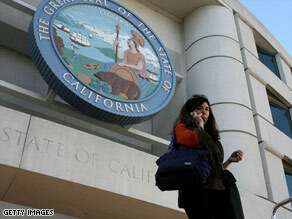 The governor said 20,000 California state workers will lose their jobs if a budget deal is not reached. The governor and the legislature are "making progress" in talks, said Schwarzenegger's press secretary, Aaron McLear. The Republican governor, who declared a fiscal emergency in December, has butted heads for months with the Democratic majority over alleviating the state's $11.2 billion revenue shortfall. "We need to continue working toward a budget that helps keep and create jobs," said Assembly Speaker Karen Bass, a Democrat, after Schwarzenegger announced the possible layoffs. Senate President Pro Tem Darrell Steinberg told the Los Angeles Times that a vote will be held in the Senate on Friday. The cuts, if they even happen, wouldn't begin until the start of the fiscal year on July 1, starting with employees of least seniority, McLear said. The cuts would save California $750 million for the year. McLear added that state workers are under contract, meaning layoffs would be a slow process. Schwarzenegger and lawmakers are discussing alternatives to avoid the scenario. Running short of cash, California last month started delaying $3.5 billion in payments to taxpayers, contractors, counties and social service agencies so the state could continue funding schools and making debt payments. A recent poll reported a record number of Californians see their state heading in the wrong direction and expect the economy to go from bad to worse. Seventy-five percent of Californians polled said the state is going down the wrong path and 77 percent think the economy will deteriorate further in the year ahead, according to a Public Policy Institute of California poll released January 29. Only 30 percent approve of Schwarzenegger's handling of the budget and the economy, the poll said. The legislature fared worse: 14 percent of Californians approve of its performance on the budget and taxes; 15 percent approve of its handling of jobs and the economy. CNN's Lynn Lamanivong contributed to this report.